These awards are available to all Radio Amateurs who submit evidence of having worked 100 approved current entities with no "Deleted" entities, on each band. Confirming minimum of 100 entities on each of the 9 HF bands. VK applications must be made using the online award system. The Awards Committee can provide support to migrate from existing Excel forms. DX applicants may continue to use the Excel form until a means can be found to provide access to the online system. Contacts for the awards must all be made from within the boundaries of a single DXCC entity, excepting VHF awards, which have different boundaries. All QSO's must have been made since 1 January 1946, unless stated otherwise. Applicants are required to prove confirmation for all QSO's claimed. Paper, eQSL and Logbook of the World (LOTW) are our current acceptable confirmation standards. DXCC entity numbers must be verified by yourself before award submission using the "Verify DXCC" function. LOTW confirmations must be verified by yourself before award submission using the "Verify LOTW" function. eQSL confirmations must be verified by yourself before award submission using the "Verify eQSL" function. Only confirmations from "Authenticity Guaranteed" members of eQSL will be accepted. Physical QSL Cards must be verified by two licensed amateurs using the "Verify Paper QSL" function. If requested by the WIA, the QSL cards must be forwarded to the Awards Committee for checking. Do not send QSL cards with application. must be made from and to, land-based, or permanently moored vessels [proof required], using direct terrestrial propagation via the same mode and band without assistance of the internet or anyone for each claimed contact. Contacts made via any other means are not acceptable, such as cross-band, via a repeater, airborne, IRLP, or any other means that is deemed to be unacceptable by the Awards Committee. Prearranged contacts [skeds] or via 'nets' are acceptable as long as the other criteria are met. All information supplied in an application for an award must be accurate and truthful. Contacts must be entered on the form as instructed on each award application. QSO's may be made using multiple callsigns providing each call used was issued to the applicant at the time of the claimed QSO(s) and all contacts were made from the same DXCC entity. Scanned copy of multiple licenses may be requested to prove the license(s) was/were issued to you at the time of the claimed QSO(s). All QSO's claimed must be on bands/sub-bands/modes/power-levels permitted by the licensing authority for that class of license at the time of the contact. All individual contacts must have been made using the same mode & band in both directions. Awards are available in the following modes: OPEN, CW, PHONE and DIGITAL. PHONE: SSB, ISB, DSB, AM, FM, NBFM, PM and other forms of voice transmission/reception. Digital: using any/all digital modes, in any combination (except CW). Digital modes include RTTY, PSK-31, JT65, etc. and any modes that are only machine-readable, and any that use computer sound card technology, with the exception of digital voice, which counts for Phone. If the callsign of applicant has changed, they may apply to have the change shown on the standings instead of the old callsign, as long as it relates to the same country as the original application. Only contacts approved by ARRL DX Desk will be accepted for credit.We follow the Rules and Definitions for DXCC approved & deleted entities and operations. Decisions of the Awards Committee are final and not subject to dispute. Specific award rule variations may apply and are stated on that award page. DXCC awards may be endorsed for SINGLE BAND, SINGLE MODE, QRP, SWL based on applicant data. Holders of new and existing DXCC awards may apply for endorsements. Applications for increased totals are to be made in multiples of 25 from 100 to 325; thereafter in single units. The W.I.A. DXCC Honour Roll achievement endorsement is issued to applicants who have confirmed nine less than the total on the DXCC entity list. The W.I.A. DXCC Excellence achievement award is issued to applicants who have confirmed the total DXCC entity list at time of application. A beautiful Plaque is available for a nominal charge. Contact Awards Manager for details. Direct two way un-assisted contacts via Satellites (SAT) is available as from 1st of March 1965 as a unique award. Satellite assisted contacts are not valid for any other award. Should an entity be deleted from the DXCC list by the ARRL, credit for that entity will be allowed if worked before the date of deletion but will be indicated for credit only in the “deleted Country” category. DXCC rankings will be published in Amateur Radio Magazine, and updated on the WIA website on a regular basis. If you do not want your call in the listing, then contact the awards manager. When a listing is no longer licensed or has died, the entry will be removed at the first opportune time. The DXCC ranking list will show two numbers in determining the ranking: (1) total, minus deleted credits, (2) total including deleted credits, e.g. 200/220 meaning 200 current entities and an extra 20 that have been deleted at some time, but were worked before the date of deletion. Single-mode awards must include 100 or more DXCC entities exclusive to the mode claimed. 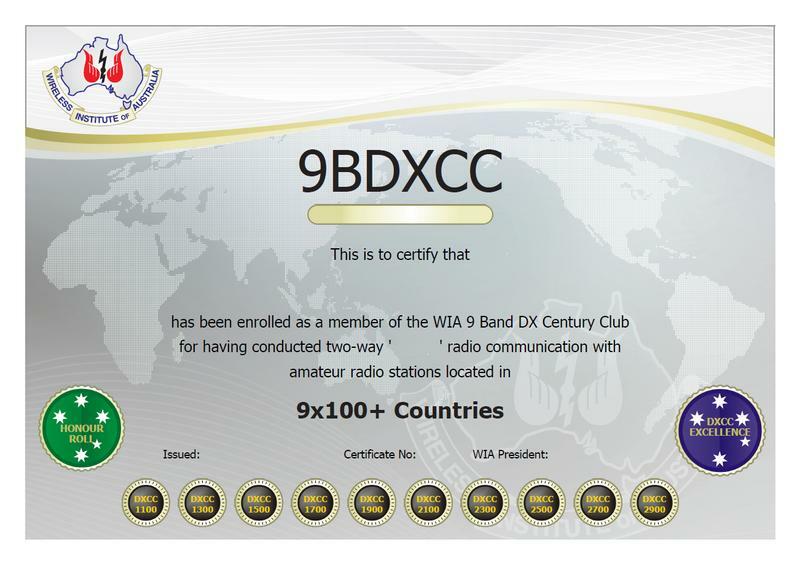 Multi-band awards must include 100 or more DXCC entities exclusive to the bands claimed. 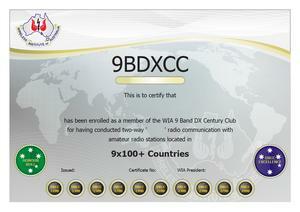 Single-band awards must include 100 or more DXCC entities exclusive to the band claimed. For clarity, the ‘common’ name is used to indicate the type of modulation. Mode may be shown as the common name or the technical indicator on applications. If in doubt, contact the Awards Manager for clarification awards@wia.org.au. Contact & Confirm a minimum of 100 DXCC entities on each of nine (9) HF bands. Endorsements are issued at increments of 200 entities. (Purchased separately) (1100, 1300, 1500, 1700, 1900, 2100, 2300, 2500, 2700, 2900). WIA "Honour Roll" achievement is available for reaching a minimum level of 331x9=2979 entities. WIA "DXCC Excellence" achievement is available for reaching a minimum level of 340x9=3060 entities.